Perhaps they would not have been caught if they saw CSI? Just when you thought we were all done with Easter stories and could go back to a shameful televangelist, an abusive priest or even someone actually living for God and for real, we come across two dimwitted broads who evidently didn’t get enough from the Easter Bunny and decided to hop in to holiday yore with their latest stunt. According to the Sacramento Bee, two women took advantage of being “just a visitor” at the Church of the Nazarene on Arden Way and decided to make their way out the door of the church office with “between $10,000 and $25,000 in cash and checks” before anyone could verify who they were. Classy. The women – described as African Americans in their 20s – left in a faded black ’80s sedan, Jones said. One was wearing a purple shirt, the other a black shirt, Jones said. No arrests have been made. 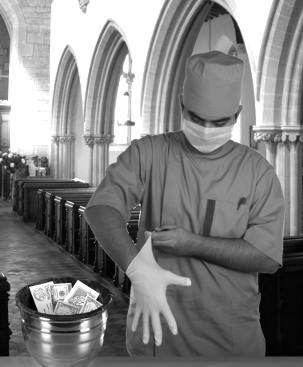 Church members who made an offering with a check during the early service have been advised to stop payment. Yes, please stop payment unless you would like your Easter offering to go Ray’s Pawn Shop on the south side for some cheap fur coat, a used Nintendo DS and possibly a pack of Lucky Strikes. How fast do you have to want to get to hell when you steal from a church on Easter Sunday? I’m sure these women weren’t after money for the rent – they staked the joint and got sticky fingered when no one was looking. “To steal from anyone is an outrage. To steal from a church is a double outrage and to steal from a church on Easter Sunday – that is beyond outrage,” Bowler said. Why not a triple outrage? Only Bowler knows. Perhaps he only saves threes for Easter holidays. That’s awfully pious of him, right? Man that is real crazy ….. but these are the sign of the times. Less respect and more selfishness is the way we are focused as a society!